Bohlin Cywinski Jackson’s new Apple Store opened in September in the famous Oculus, the new World Trade Center Transportation Hub designed by Santiago Calatrava, an important place of transit for commuters and tourists in the Big Apple. It is the city’s twenty-first Apple Store, the seventh to be designed by Bohlin Cywinski Jackson. Oculus, the new World Trade Center Transportation Hub designed by Santiago Calatrava, presented in Floornature when it opened in the spring of 2016, has become a place of intense pedestrian traffic for both commuters and tourists visiting the Big Apple. In this evocative, attractive place, Calatrava’s structure replacing the World Trade Center destroyed on September 11, 2001, Apple has decided to open a new store designed by Bohlin Cywinski Jackson, the brand’s twenty-first store in New York and the seventh to be designed by the architects of Bohlin Cywinski Jackson, who also designed the iconic “Cube” in Fifth Avenue. The new store has a transparent façade which reflects the rhythm of the steel girders in the Oculus and establishes a strong visual link with the foyer of the Hub, from which users can access other commercial facilities and rail links. 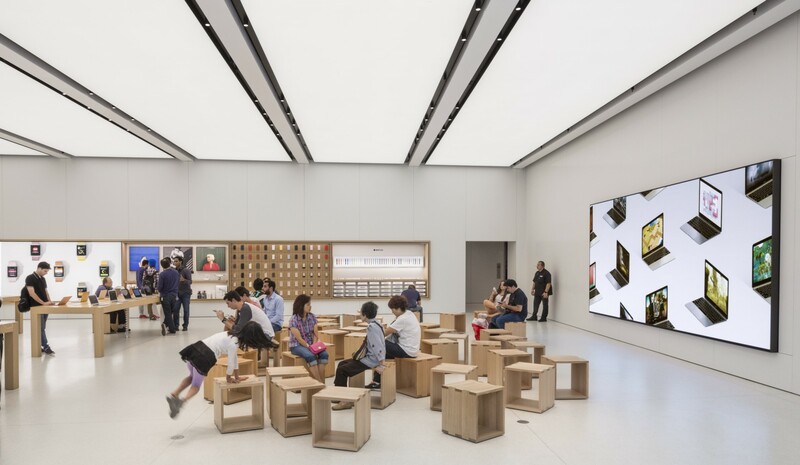 The store is built on two levels, and from the outside it appears to be a welcoming, inviting place where customers can try out Apple products and attend special events and workshops offered by the company, sitting on one of the many mobile cubic seats.